Make IoT projects with Arch Link – an mbed enabled development board based on Nordic nRF51822 and WIZnet ethernet interface. 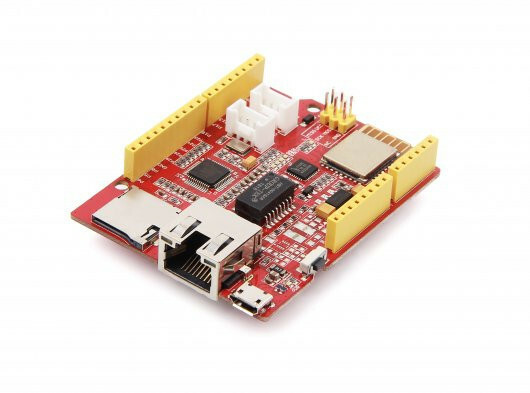 It features Arduino form factor, Grove connectors and micro SD interface. CMSIS DAP based on LPC11U35: Drag-n-drop programming, debugging using CMSIS DAP standard, USB virtual serial for communication. WIZnet W5500 Ethernet: Supports TCP/IP Protocols – TCP, UDP, ICMP, IPv4, ARP, IGMP and PPPoE. Supports high speed SPI, internal 32Kbytes memory for Tx/Rx buffers, 10BaseT/100BaseTX Ethernet PHY embedded.